Our planet faces many serious environmental problems, among them global climate change, land degradation, soil erosion and pollution of the biosphere. There is though an even more serious problem that surpasses all others in term of importance - loss of biodiversity (extinction of species), as the most severe and irreversible consequence. Around the world, humans are responsible for a worsening trend of net loss in the amount of "untouched", natural habitats that cover our planet. Even though the working groups involved in this excursion are no specialists in their assigned field, it was still our aim to identify as many organisms as possible (although, the sheer amount of organimic diversity just flooded both our eyes and recognition). The manifold display of live present on these reefs becomes even more valuable if we consider that many of them are lost even before scientists had a chance to document the rich array of organisms that thrive in our biosphere and determine their potential benefit to human kind; perhaps as sources for new medical treatments or economic livelihood. At a global level, there are roughly 25 regional land areas that account for 40% or more of all terrestrial diversity which are at great risk (see also threats to reefs). PNG, fortunately, is still an area that is largely prestine, man-made impacts are low, and the natural beauty still acceptable. PNG is probably one of the few Southeast Asian countries that has this natural framework; and if ever this country decides to make profit out of this natural resource, this it should be done carefully and under strict surveillance in order to maintain the natural environment. 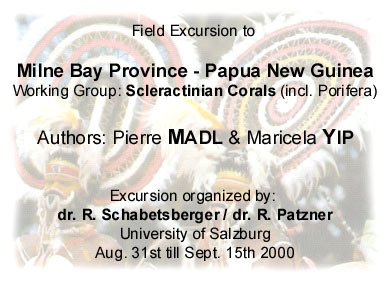 PNG is part of the "coral triangle" that comprises countries like Indonesia, Malaysia, Japan and Australia. It houses the most biological diverse coral reefs, mangroves, and sea grass beds in the world. 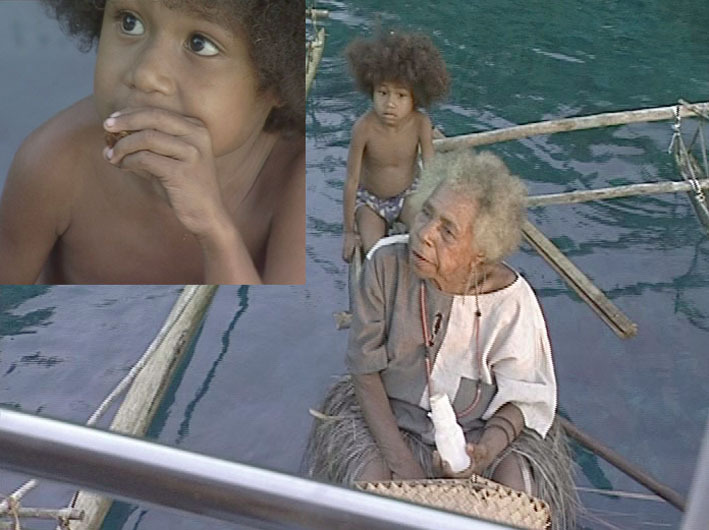 The waters of PNG are shallow over extensive areas, and there are innumerable islands both large and small. In places, such as the Gulf of Papua, the water is turbid from the inflow of large rivers and coral growth is restricted. 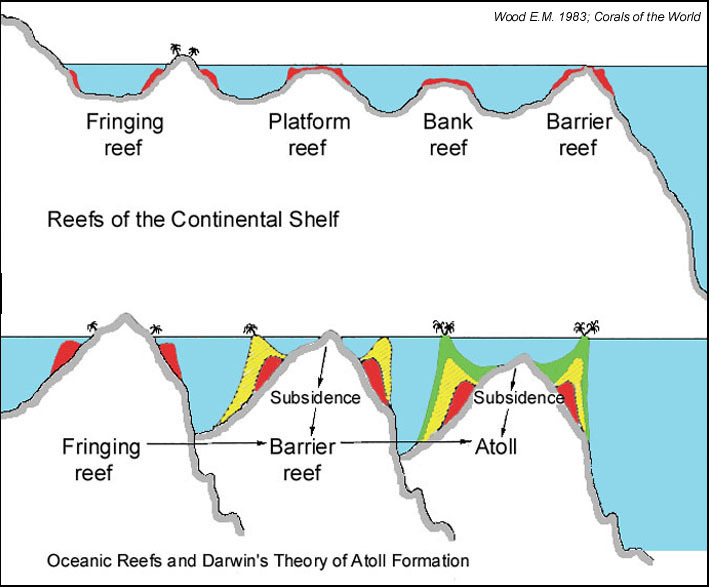 There are innumerable fringing, platform and bank reefs, some small barrier reefs and a few atoll-like formations. 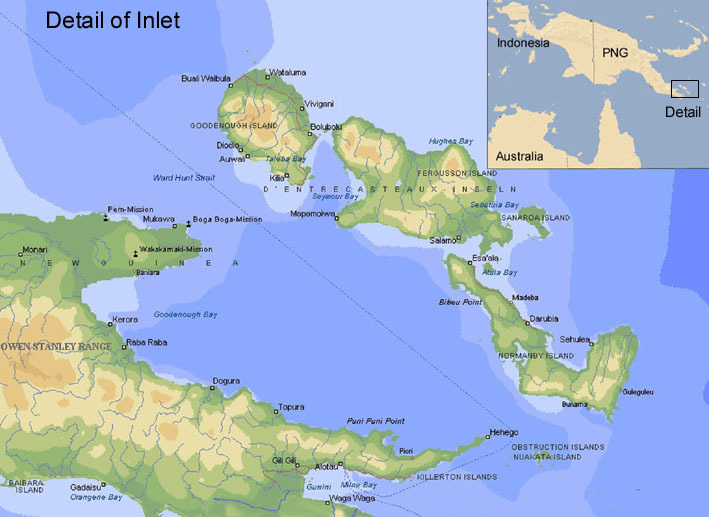 The reef life is extremely rich and diverse, and the area is generally considered as one of the faunistic center of the entire Indo-Pacific region. Between the Coral Sea and the Solomon Sea lies a beautiful and intricate chain of pristine volcanic peaks, coral islands and reefs. It is part of Milne Bay Province, PNG's largest maritime province and with only 180E3 inhabitants - one of its least populated. Although there are several large-scale development projects in the province (including mining, proposed oil drilling projects, coconut and oil-palm plantations), most people make their living primarily by subsistence farming, fishing, hunting, and the occasional sale of products from these activities. Physical environment: The climate is monsoonal, tropical, with much of the year being hot, still, and humid. During November to March a prevailing westerly and north-westerly rain-bearing monsoon dominates, while a dry south-easterly trade winds become evident from May to September. Being close to the equator, parts of PNG are rarely affected by hurricanes but are exposed to strong oceanic swells. The underwater current patterns in the visited area are highly complex and strongly localized. These are generally influenced by tides, although, there does not appear to be a significant tidal fluctuation. Several sites reveal strong currents on one side of the reef, while 100-200m away on the sheltered side, virtually no current is evident. Sea temperatures range from 25 to 27�C (month of September). 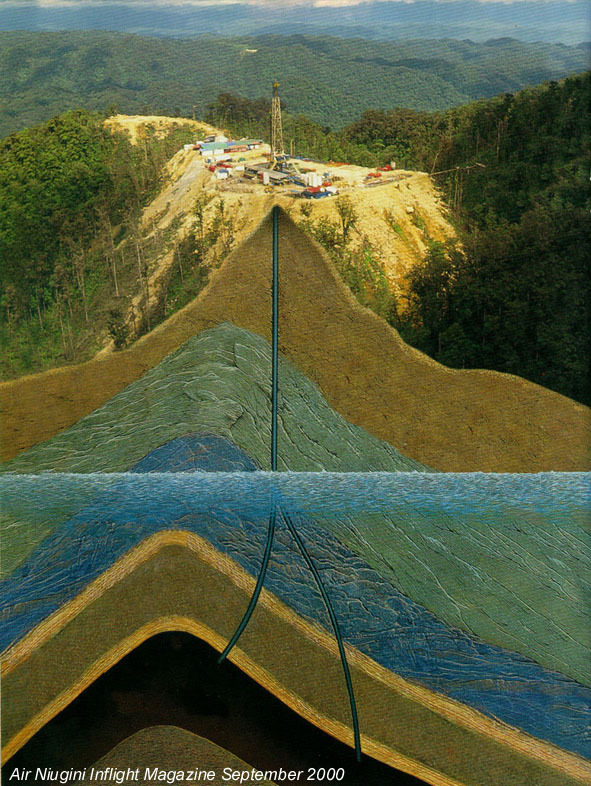 Large areas of PNG are part of the "Ring of Fire" a geological active zone that is constituted of several volcanoes, hydro-thermal vents, and hot springs. Especially the northern edge of PNG is subject to earthquakes and tsunamis. 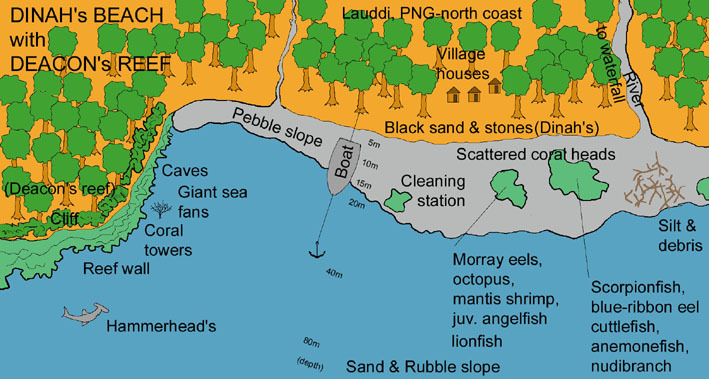 Reef morphology: Four major types of reef structures are present in Milne Bay Province; fringing reefs, platform reefs, atolls, and barrier reefs. The major habitats can be divided into various categories depending on their degree of exposure to wind, waves, and currents. Exposed seaward reefs lie at one end of the spectrum while sheltered lagoon-type reefs at the other end. In-between, there is a range of intermediate reef types which combines various proportions of outer shore and lagoon properties. Deacons Reef and Dinah's Beach: Deacon's reef comprises of a steep drop-off that easily exceeds the 100m mark. Being close to the shore, a series of coral towers reach almost the water surface where they easily could come into contact with the overhanging branches of shoreside trees. Besides exquisite coral growth, this site offered also a large display of sea fans (Gorgonaria), whips (Antipathes and Cirripathes), and large Tubastrea colonies that are even accessable to snorkelers. Neighboring Dinah's beach on the other hand is a predominantly black sanded slope that houses tiny coral islands. Several families of cephalopoda (Octopus), black gobies (Asteropteryx endifer), lion fish, blue ribbon eels (Rhinomuraena quesita) angle fish (Pomacanthus imperator), cuttle fish and pelagic ctenophores as well as salps can be observed. Banana Bommie*: This outer patch reef environment is just small enough to swim around on a single tank, but it is best to dive only whichever side is receiving the current (usually the west). The reef is incredibly rich, and the sheer numbers of marine life are staggering. The reef top houses large numbers of staghorn corals (Acropora), while the reef-side vertically slopes down to the sandy bottom at about 27m. Among garden eels (Gorgasia) also Heteroconger are easily recognized; furthermore, there are batfish (Platax tiera), gray reef shark (Carcharinus amblyrhynchos), colorful red-lined sea cucumbers, masses of small fish (Chromis ternatensis, Pseudoanthias huchtii) and much more. Boia-Boia Waga: A reef with a huge dropoff that plunges to depths of 40-50m; it displays a large selection of soft corals (Alcyoniidae), sponges, tunicates, crinoids, black corals, small seafans, etc. Turtles are quite common in this area as well. The lagoon area with its impressive thickets of staghorn (Acropora) and some outstanding bommies* form a heaven for thousands of cardinalfishes (Apogon). Even though some claim that it features manta rays (Manta birostris) and Hammerhead sharks (Sphyrna lewini), none of these species have been sighted on our visits. Black and Silver Reef: It is an outer patch reef environment consisting mostly of large, circular pinnacles with 6-8m on top of the reef and dropping steeply - almost vertically into deep water. Besides a very large concentration of fish along the slopes (due to strong currents and numerous hiding places), it also has an abundant aggregation of black coral (Cirripathes), anglefish (Genicanthus lamarcki), large amounts of Tubastrea corals, and a splendid display of the larger sponges like (Xestospongia, Speciospongia), besides many different species of sea squirts (Ascidiacea). Little China Reef: It lies west of Nuakata Island and is a very pretty reef with lots of colorful corals and fish; a place where white tip reef sharks (Trianedon obesus), the Maori wrasse (Cheilinus undulatus), and large barracudas (Sphyranea barracuda) are quite common. This is a relatively sheltered and shallow reef that drops off gently at a roughly 45� angle. Rich corals in shallow waters, predominantly Acropora, and patchy growth along the slopes characterize this site. Sand and scattered bommies* dominate below the 20m line. (*) a coral bommy is a patch reef structure probably the size of a reasonably big house. 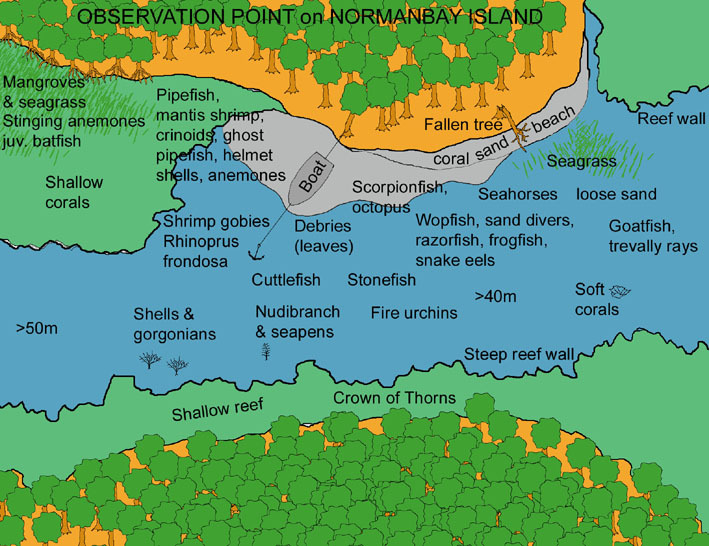 Observation Point: A coastal lagoon environment that both combines coral reef, with sea-grass (Enhalus acoroides) and crocodile infested mangroves; it borders a steep sandy slope dotted with crinoids and coral debris. Although less spectacular, and at certain spots partly dead, it offers some very unusual marine life that range from Padina algae to sand darters (Trichonotus halstead). On the other side of the strait, some very active coral predation by Crown of thorn starfish ( Acanthaster planci) can be observed. Mapamoiwa: A silty coastal reef with very few fish species, but in large numbers, small massive coral colonies (Porites sp.) that exhibit a wide variety of color patterns. Apart from the occasionally passing sharks, this reef features not only a very deep dropoff but at the leeward side a rich display of soft, stony corals, and huge barrel sponges (Xestospongia testudinaria), besides a very rich fauna of higher invertebrates. Barrier Island situated between Goodenough and Ferguson Island, stuns not only a trained diver but makes even a firm snorkeler forget to breathe (! ); this very shallow reef impresses with the large display of octocorallia (like Dendronephytha sp. ), an impressive variety of nudibranches (among them Notodoris sp., Phyllidia sp. ), lobsters (Panulirus sp. ), impressive giant clams (Tridacna gigas), numerous rays (Taeniura lymnia), sea turtles (Chelonia mydas) are among the most obvious, must capture even the saturated biologists. Ferguson Reef, likewise located between Goodenough and Ferguson Island is somewhat less spectacular than the previous site, but houses large areas of corallinacean algea (like Halimeda), and an immense aggregation of foraminifera (probably Marginopora), which offer a superb insight into the frame-building network of a coral reef. A rather dense accumulation of soft corals (Dendronephthy sp., Sarcophyton sp., Xenia sp. etc.) are indicators of sedimentation that probably occur regularly at this site. Julian's Reef is one of the many reefs to the west of Normanbay Island and lies just north of the small Duchess Island. It has a beautiful scenic reef with very rich hard and soft corals, fans, crinoids and lots of interesting gutters and gullies to explore. There is a ledge on the western side about 20m and about 10m wide, as well as a wall dropping down to 60m or more. Many varieties of fish life; e.g. brown-spotted cat-shark (Chiloscyllium), toadfish (Arothon hispidus), butterfly fish (Chaetodon), and triggerfish (Balistoides), large moray eels (Gymnothorax), and the dreadful crown of thorns (Acanthaster planci). After traversing the NE corner it is possible to return to the boat by way of a small channel where huge colonies of cabbage corals (most likely Turbinaria) are growing. Initially, the various working groups were given different phyla to work with: annelids, echinodermata, scolicidae, molluscs, crustacea, chordata, pisces; our group was given the task to document the manifold diversity of porifera (sponges), cnidaria (also known as coelenterates like hydroids, jellyfish, corals sea anemones and black corals) and whenever possible to document the presence of bryozoa (moss animals).